Decided to lower my car further from M030 using Eibach -30 springs this week, I was hoping to get X74 geo but the guy in Kwikfit was having all sorts of problems on their Hunter alignment system which I believe is fairly foolproof. After almost 2 hours of faffing around and my guidance (!) they couldn’t get it aligned so didn’t charge me. The strange thing is that they couldn’t get matching camber settings on the rear wheels despite most suspension components being replaced on the car within the last 2 yrs (under 15,000m). I’ve ended up with 0.12’ toe either side but the rear left has -1.5’ Camber and the Right has -2.35’. X74 spec is -1.4’ +/- 10’ so I could live with the rear left but why is the right out so much when matching components have been used? They just couldn’t get the toe v’s camber balance right. Am I going to need to buy ADJUSTABLE toe control arms or is something else required? Annoyingly I only replaced the standard TRW arms 3 months ago so I’d prefer not to buy new ones or do you think that another more experienced shop could get it aligned? I’d like to not spend a small fortune changing parts and repetitive £100 geo sessions but need to fix it soon to save my tyres. Advice appreciated thanks. I live near Sevenoaks in Kent if anyone can recommend an experience alignment shop. Something odd is going on as X74 is achievable on OEM/standard parts- my car is an example of that. To go lower (GT3, basically) you do need to start swapping out parts to correct the camber induced by the drop. GT3 rear subframe sits 1/2" higher in the chassis due to the solid mounts. Elephant racing and others sell aftermarket versions. Bent hub carrier, mounting points etc can have normally sane alignment operators chasing their tails. You need some adjustable rear toe arms. The stock adjustment makes the toe and camber co-dependent, and when you run out of toe adjustment, you are limited on the amount of camber you can dial out. 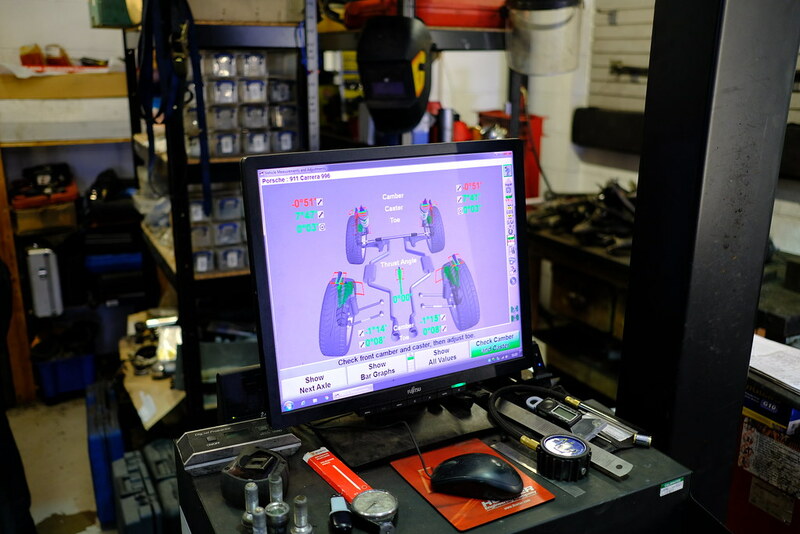 Adjustable rear toe arms solves this problem by allowing any toe setting with any camber the car is capable of being adjusted to. Edited to add: I know that GT3 solid mounts would be OEM, but I don't have them, or adjustable control arms, or anything designed to allow for a drop without compromising camber - so the OP doesn't need those parts to get to X74. That he can't means that something odd is going on. My C4S is using all stock OE spec parts APART from a PSS10 springs and dampers. No trick adjustable aftermarket arms, top mounts or anything. Installed and set up at Center Gravity. Stock M030 heights were 126mm front and 150mm rear. OP, it would be worth getting a second opinion from a specialist used to alignments on Porsches. Adjustable arms may well be the answer but it might pay you to fully understand what it is you're correcting with them. I'd highly recommend Center Gravity. They're running a special deal on health checks during January - call them now! Rear: 133 mm to 143 mm"
Having chatted with Chris and Pete at Center Gravity we all agreed mine could go lower but a) I need to be able to drive the car everywhere and b) I'm not 18. Similar issues with me last month, I fitted the Eibach Pro -30mm kit and took the car in with the X74 settings. Couldn't be done initially as all the adjustable bolts had seized. Long story short I replaced all the suspension components with stock and took it back but he still couldn't get it set up right. I phoned Spyderperformance who said the settings needed to be done in a specific order and the chap phoned my garage to talk him through it. "Installed and set up at Center Gravity. Stock M030 heights were 126mm front and 150mm rear." Teffers/Hertsdriver - I’m pretty sure that my car hasn’t been involved in a crash, no evidence seen when replacing parts on all the corners and it’s had 3 alignments with standard & M030 suspension and apart from seized bolts there have been no problems with (more conservative) alignment specs. Phil 997 - I’d love to have the car checked over by CG but it would be an 8 hour return trip on my current geo and require a full tank of juice and a hotel for the night, also their health checks dates are in Jan and I need to get it sorted before then and don’t know when I’ll be working yet. It would be cheaper to buy adjustable arms which I may have to do anyway. Dammit - I agree with you that it should be able to get to X74 spec, maybe one of the suspension components is from a different batch and the dimensions are slightly out it would be a ***** to track that issue down. I’m going to check ride height as it may be sitting lower in the rear and the camber/toe issues get worse the lower the car goes. Still doesn’t explain the asymmetric camber but the Kwikfit guy was out of his depth and I don’t have much faith in his skills. Mind you if the ride height is wrong there probably isn’t much I can do about it with non ride height adjustable M030 shocks. Are jack up spacers available? BTW Dammit your rear camber specs seem to be a fair bit less than X74 at the rear (normally 1.40’ +/- 10’), slightly reduced rear grip to balance the front? MartinRSR - I’m leaning towards having to buy adjustable toe arms, any comments on the 2 linked above, those Hardrace ones look better VFM at first glance. Does anyone else have any recommendation? Some are priced at £600! Grey996 - I’d be very keen to know more on the procedure that was used on your car, problem is that I haven’t bought anything from Spyder performance so they may not appreciate me requesting the same service they offered you. Same goes for CG as it’s unlikely I’ll be using their services. Seems like some of these cars suffer this issue when lowering -30mm and others seem to get away with it. I’m not back in the UK until Monday and will have to wait for a dry day to fiddle with the car so the more info I can research now the better. I doubt it's down to accident damage. Every car is different and whilst some can go a bit lower and get within factory specs for setup, loads can't. Coffin arms and other components vary from manufacturer to manufacturer and even batch to batch. I'm in exactly the same position as you on my lowered KWs although I'm lower than M030 and X74. I'll be buying the String Theory Garage adjustable arms in the new year. Simple and well known solution to get the rear into spec. Another chunk of cash mind when you think you're all done with spending on the suspension. As for the Hunter machines at Quikfit, yes they should be foolproof but then Quikfit train up a better fool. I visited 2 branches up here over 4 visits. 4! Each time there was a reason they couldn't sort it. Basically they have the gear but no idea. They seriously need to train some lads who give a ***** about what they're doing. Whether the problem is the wage who knows, but the Hunter rigs are wasted there. Absolutely no issues getting mine aligned to X74 when H&R -30 spring were fitted in October. All suspension components other than springs and shocks are stock Porsche. I'll be lowering my car too. Any recommendations on adjustable toe arms? Do I really need to spend £500-£600? Mine didn't cost anywhere near these collecting the bits myself and fitting them together, you probably already read the below thread? Likely 'operator error'. 911's and boxsters aren't the easiest to align at the best of times. If all you're used to doing is corsa's you'll struggle to get a 911 in spec, let alone if it's lowered. Its quite funny watching the confused faces sometimes - when they adjust the toe and then get frustrated that their carefully adjusted camber has moved! Infra that's great. Glad you posted it as I've never seen it before. Do you mind saying how much it cost in total including Alex's machining? Also I've read it twice but can't actually see where you bought the rose joints for the inner ends. Any part numbers for outer track rod ends or are they just definitely standard front ones? I think I'll do this as I've spent enough on my suspension now and I'm not that happy about spending £280 on adjustable arms, £30 on non-camber bushes for front, plus another £140 alignment up here. £450 just to get my camber down from from -2.3 degrees to -1.